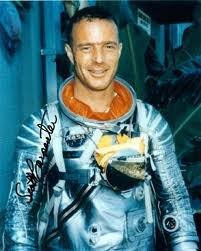 On May 24, 1962, Commander Scott Carpenter roared into space in a Mercury space capsule. He piloted his Aurora 7 spacecraft through three revolutions of the earth, reaching a maximum altitude of 164 miles. The spacecraft landed in the Atlantic Ocean about 1000 miles southeast of Cape Canaveral after 4 hours and 54 minutes of flight time. Following his return, NASA Administrator Webb presented him with astronaut wings in a ceremony at the Cape. Then on June 5, New York City celebrated his flight with a ticker tape parade and President Kennedy honored him at the White House. In the middle of the White House ceremonies, his five-year-old daughter, Candace, tugged at his sleeve. She wanted to show her daddy the scratch on her right elbow that happened while he was gone. What did he do? Yes, he turned away from the honors, away from the acclaim of a proud nation to give his attention to the concerns of his little daughter. A scratch on the elbow was important to her, and so it was important to him. In our hurt, Jesus Christ can sympathize with us. Dear Jesus, we confess our weakness to You today knowing that you understand and we are important to You. Help us Run to You today. In Jesus’ Name, Amen.